Jose Mourinho has confirmed Paul Pogba is no longer Manchester United's vice-captain, but denied reports of a bust-up between the pair. Pogba, who has taken the captaincy three times this season in the absence of Antonio Valencia, was critical of United's defensive style following last Saturday's 1-1 Premier League draw with Wolves at Old Trafford. The World Cup winner, however, suggested his comments had been "twisted" in a Twitter post on Monday. Reports on Tuesday suggested Mourinho told Pogba he would never captain United again to underline his authority at the club. 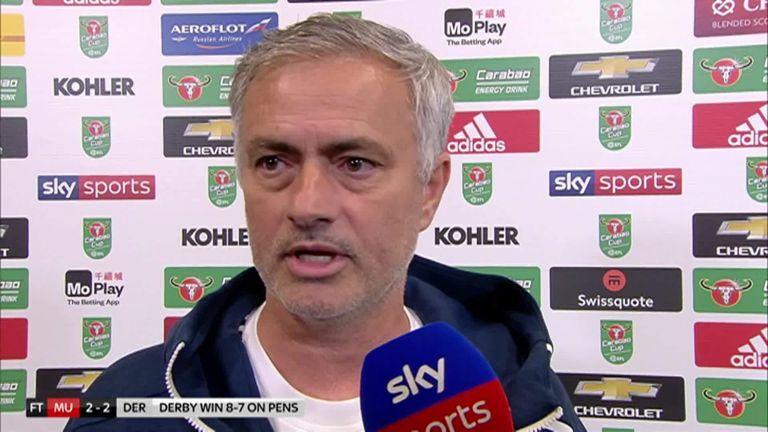 Asked after United's Carabao Cup home defeat to Derby on Tuesday if the stories were true, Mourinho said: "No. The only truth [to the reports] is that I made the decision for Paul not to be the second captain anymore. "But no fallout, no problems at all. The same person that decided Paul is not the second captain anymore is the same person that decided Paul was the second captain - myself. "I'm the manager I can make these decisions, no fall out at all, no problems at all. Just a decision I do not have to explain." Pogba caused a stir following United's opening-day win over Leicester, saying he would be fined if he were honest about his situation at the club. Barcelona and Pogba's former club Juventus have been reportedly linked with a move for the 25-year-old.